Bridges often form an important focal point or strategic element in a game, and can also often make attractive centrepieces for interesting dioramas. 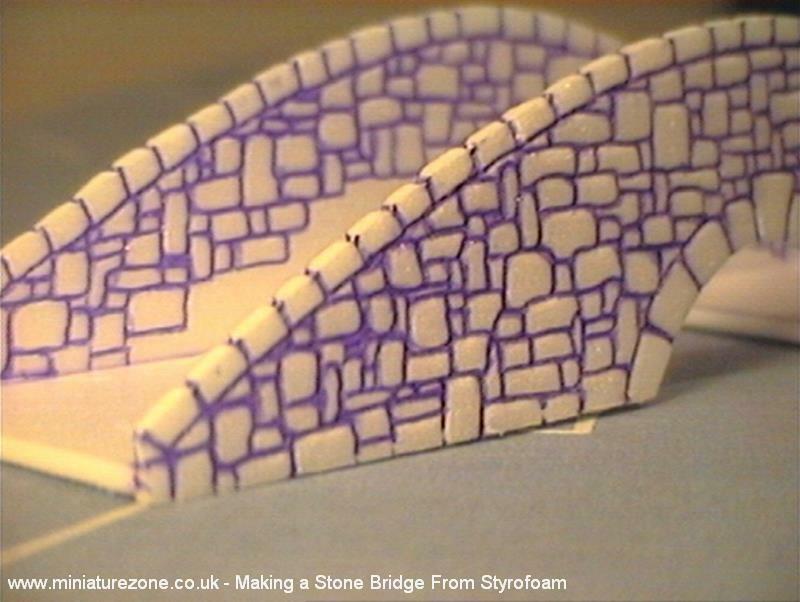 Building from scratch is not too difficult and the object of this article is demonstrate how to build a simple but effective representations of these stone bridges. 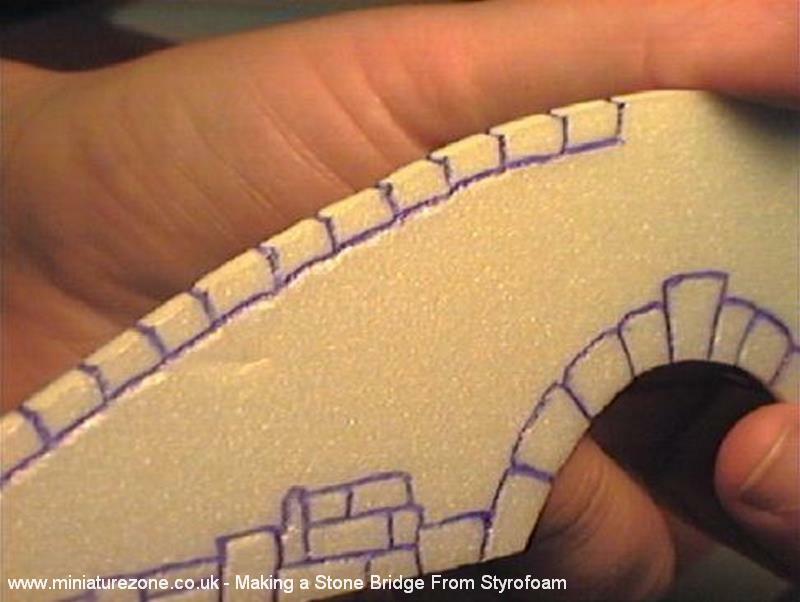 The main material used to make our bridge here is EPS foamboard (greatly superior to expanded polystyrene) because it’s compact, can easily be cut without crumbling and is durable. 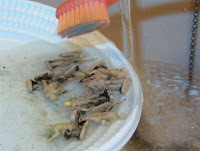 You can buy it in sheets at hardware stores (a well known brand is called “Depron”) but you can also use the same stuff that little trays are made of that you find in supermarkets to pack fruit or meat. In order to make the bridge we’ll first need a master and making this isn’t particularly difficult, though it can be a little time consuming. 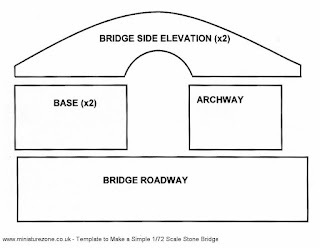 For a basic bridge we need to make four templates from very simple shapes as shown here. 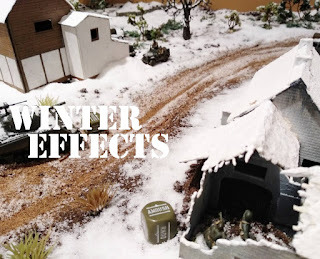 If you click on the image below it will open in a new window. 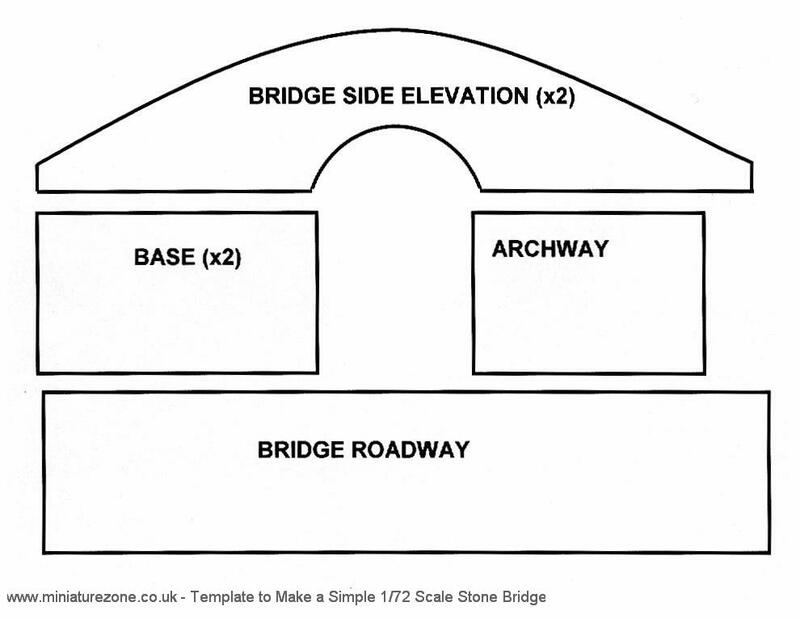 You can download and print the template onto A4 paper. 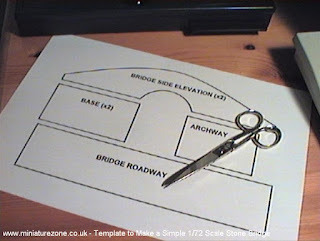 Print your masters onto a sheet of A4 size paper, then with a pair of scissors cut the templates out. 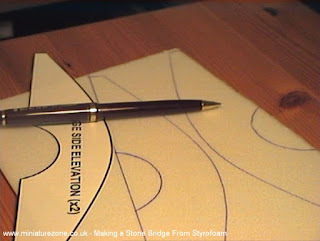 The sides of the bridge and the base sections will be made from foamboard, so we’ll use shapes we’ve cut from paper as templates Place these templates onto the foamboard and lightly draw around them with a ball-point pen and then with a sharp craft knife cut the foamboard along the pen lines. We need to make the pattern convincing so it’s important to take a little time doing this. Best not to use anything sharp to do this, you´ll need to use a ball-point pen because instead of scratching on a design, we have to leave an imprint and the ball-point pen “glides” across the foamboard. Once we’ve got the stone pattern finished then we can assemble the bridge. Stick the two sides of the bridge to the bases with white glue and wait for it to dry overnight so it’s fixed well. 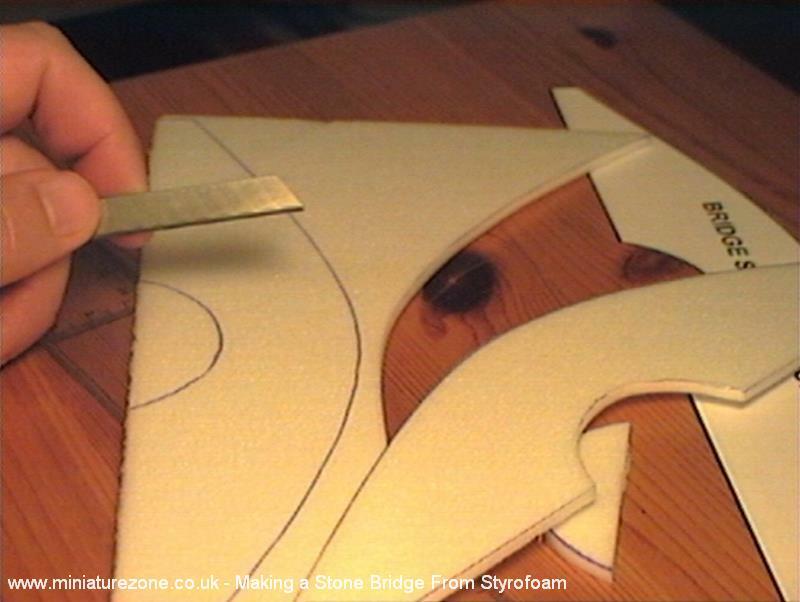 The next stage is to make the road section from stiff card,making sure that it curves without any creases and just stick with white glue (a bit tricky and you might have to hold this for quite until it’s stuck well). 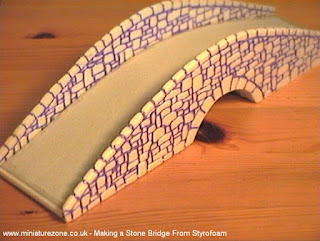 Finally the last piece to glue the underside of the bridge’s arch. Painting is a matter of personal taste and everyone has their own techniques and preferences. 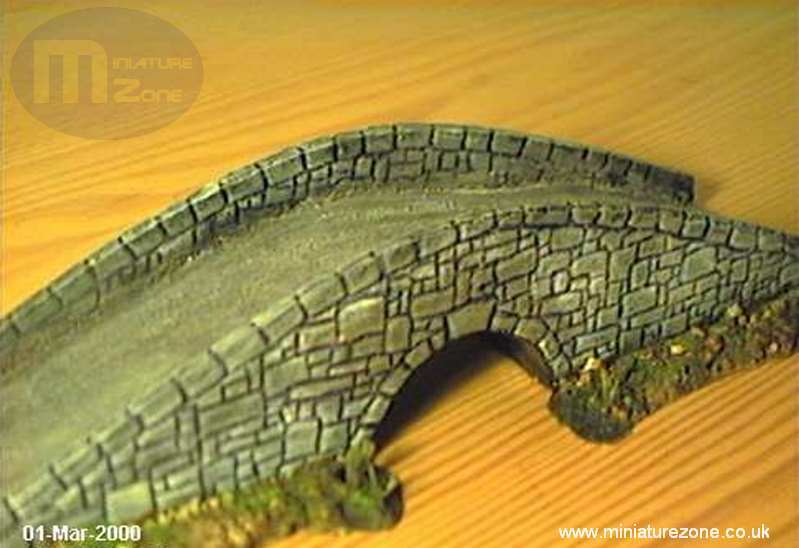 I used artist’s latex based paints that you can buy from hobby shops, starting with undiluted black paint then mixing in some very very fine sand and once you have this mixture ready paint all over the bridge and leave to dry for a few hours. 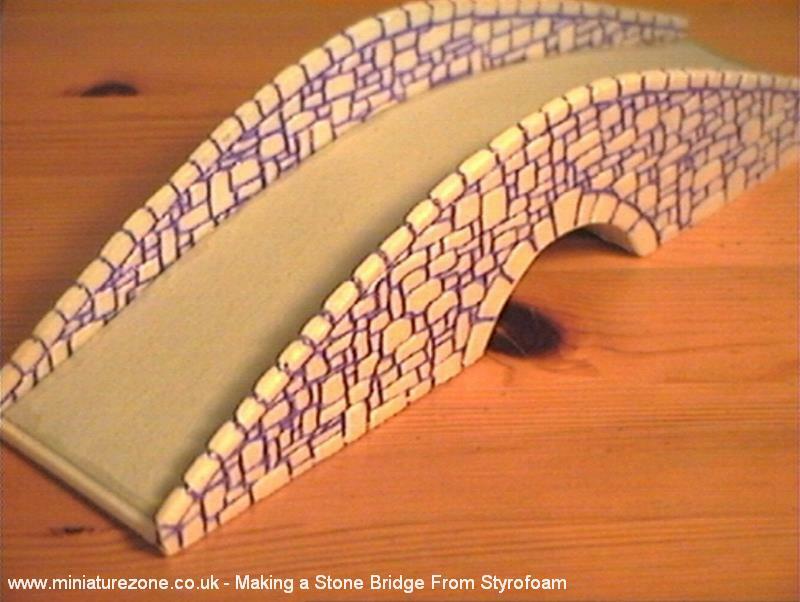 Once the black paint is dry, take a suitable stone colour and give the bridge and roadway an extremely heavy drybrush and you’ll see that the stone pattern becomes very nicely defined due to the black undercoat staying in the recesses of the pattern - it should now resemble a stone bridge. 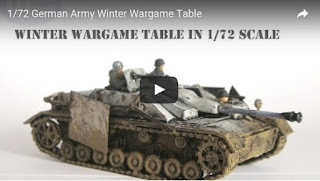 Just to finish off give a final very light drybrush with some white or other very light paint according to your preferences. 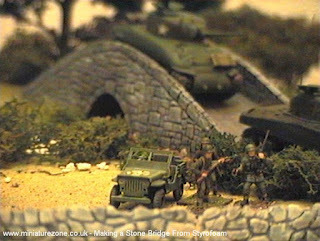 The only other thing I added was a border of grass and small rocks along the side of the base as you can see in the picture at the top of this article.